The best implant denture alternative is in Cancun Cosmetic Dentistry! 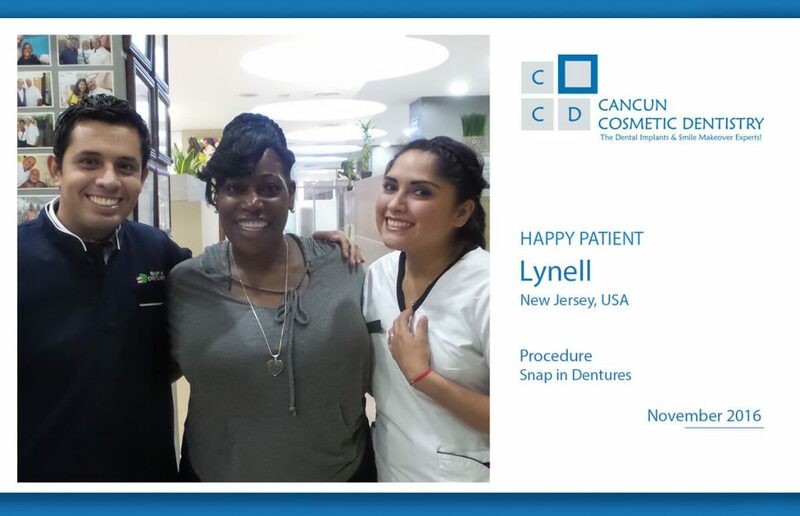 You are here: Home / Blog / Uncategorized / The best implant denture alternative is in Cancun! Thousands of Americans and Canadians are suffering from missing most of their teeth and look for the best implant denture alternative for the price. They are shocked to learn most implant dentures options cost over 60,000 USD in USA for a full set. On the other hand, our dentists in Cancun can provide you with the best palateless denture mini implant for just a fraction of that price. Come to discover a new amazing dental implant treatment to restore the look and functionality of your smile. We have plenty of Our patients talk about their experience. Hi everyone today I have another great story of snap in dentures, for all doctors that they say that they don’t work, I’ve been doing Snap in Dentures for more than 10 years I’ve been doing implant dentistry for more than 20 years, all techniques and I can tell you that Snap in Dentures really work. How is this? We place implants, we do extractions, we place implants and we do immediate load. We place implants on uppers, implants on lowers and here I have with me Brian, how are you, Brian? Cool, that’s good, well big hugs to Illinois, and how did you decide to come here? It was like a big decision? How much it was like? Well, there are other options and when you have an underbite there are different kinds of underbite and different obviously magnitudes of underbites but he has a very complex one. It was a difficult case but at the end we have a great result. So what we did is this… The challenge was to have something that it was cosmetic but also, restorative. After 8 days, we did extractions we did all the remaining teeth, all the extractions, we cleaned the bone, that’s important. Removed all the bacteria, everything. We placed those implants and after 8 days see the results. Can you please put it in, my friend? Thank you. Get the best dental experience in Cancun Cosmetic Dentistry! Doctor German Arzate just got certified by the ABOI/ID!